Well to say I only started this blog in summer, I'm pretty impressed to reach 2000 reads. Atleast someone must find my writing useful. Further work continues on refining the structure of the CAM module. Things are going reasonably well and each piece of the jigsaw is coming together. 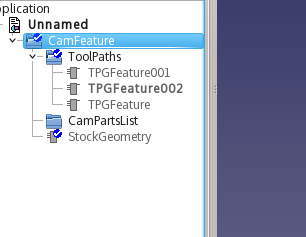 If we delete ToolPaths using the GUI, ideally we want the children (TPGFeature) to be delete accordingly. Inheriting from a App::DocumentObject we do not get such a luxury. We need to set up an signal/slot mechanism using the Boost Libraries to observe when a document object is deleted.These are pretty simple to use and remove the need for having to use QT and it's signal/slot mechanism that requires inheriting from QObject and run through the MOC preprocessor. This is fine in context of the GUI interface, but isn't necessary in the rest of the application. In the class header file we need to include these. Essentially the typedef is just a typing shortcut to make the syntax less cumbersome to write. In the class declaration we need a Connection member delObjConnection and this slot function that will be called when a signal is intercepted. In our case, when the signalDeletedObject is made within our slot function onDelete we need to have a App::DocumentObject as parameter. This slot function has to be public. That's pretty much it. Now we can delete child objects in the onDelete slot we have made!